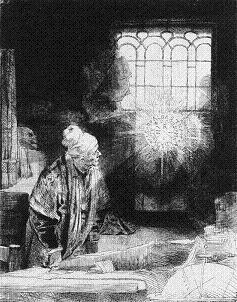 Okay, this one is a special case, but despite the picture's caption, I've just found out that this artwork is misidentified, certainly because it was mislabeled for centuries and used by Goethe to illustrate his version of Faust. But that was just a quick Google; as usual, other suggestions are welcome. Good enough. 1.1's in and tagged; caption? Like previously, the title of the artwork and artist's name would be enough. Faust's Pact with Mephisto, engraving by Julius Nisle after Goethe's Faust. Faust's Pact with Mephisto by Julius Nisle. I'm good with either of those. I'd just favour the second since we already know its a pic of Faust since its the image of this page.